This of course raises the question as to which project management accreditation the recruiting company or HR manager prefers. Quite frankly, our experience is that very often there is a distinct lack of understanding by those hiring, as to the relative merits of the credentials that are most commonly considered. The below table provides a comparison of offerings from the main providers (IPMI train both PMP and IPMA certifications). When trying to determine which certification is best for your requirements, talk to a reputable organisation that understands the difference between entry-level exam-based PM certifications, and the advanced certifications that can correlate to increased project and business success. The challenge faced by everyone is the ever increasing rate of change, driven by new knowledge, new ideas, new management fads and of course new technologies. 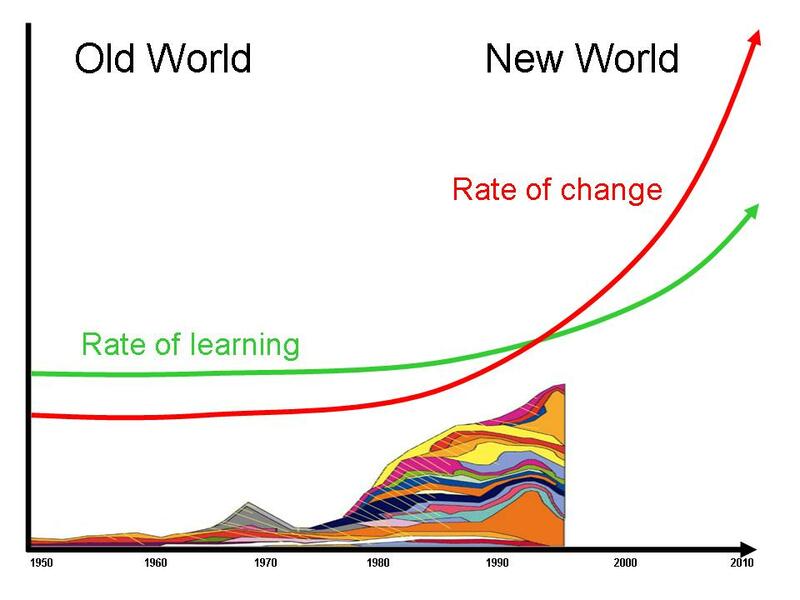 As individuals and organisations we need to continually accelerate our rate of learning, and according to Eddie Obeng in his TED presentation ‘Smart failure for a fast-changing world’ the world is now changing at a rate faster than we can assimilate the new information, making errors and mistakes inevitable. In the old world, a competent person could keep up with ‘all’ of the relevant changes in their area of expertise and be expected to get the ‘right answers’ – in the new world we simply cannot. What was ‘right’ based on the old paradigms is unlikely to be the best answer now or in the future and there’s no way of knowing if your innovative solution to a problem is right or wrong until later. Timely decisions based on assumptions and partial information are essential (see more on decision making). And adaptation and rapid learning from your mistakes is the new normal. Obviously this is helped by access to useful information. The challenge is sorting ‘useful’ information from the ever expanding ‘noise’ in every aspect of life, within the ever shortening timeframes needed for effective decisions. This ‘fad-o-gram’ is from ‘The Ebbs, Flows and Residual Impact of Business Fads 1950 – 1995’ by R. Pascale. 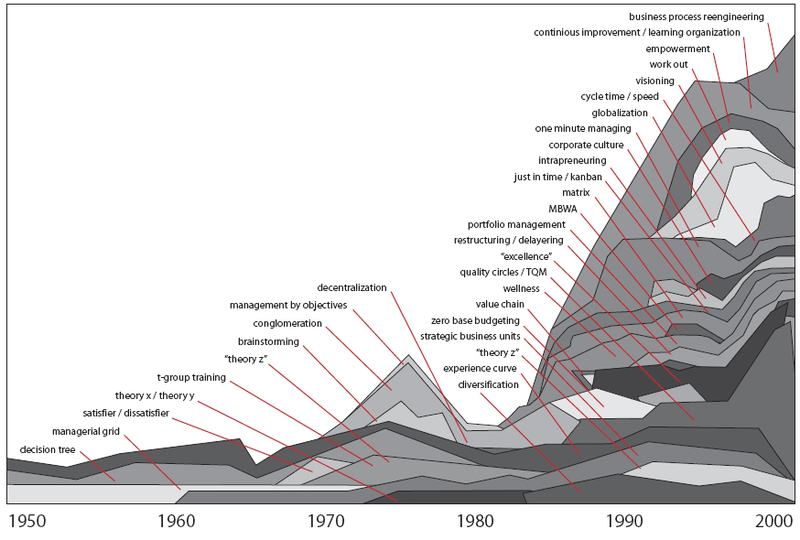 The chart was developed from a statistical analysis of the indexes of the influence of business ideas, calculated by Richard Pascale, using an importance-weighted citation count, admittedly with a significant subjective component. The first surprise is the number of ‘defunct’ management theories that are still included in the PMP course requirements such as ‘decision trees’, ‘theory x – theory y’, ‘brainstorming’ and ‘management by objectives’. I have a feeling this is more likely to be a factor of the interest in the concept by author’s looking for a new idea to have their academic papers published, or sell their books, than the actual usefulness of the concepts but equally there are literally dozens of fads and fashions that have arrived, been championed as the solution to all known problems and then died. The second surprise is the omission of ‘project management’ including ‘program management’ and ‘project portfolio management’. Presumably projects were seen by Pascale as planning processes rather then management theory. From the perspective of management theories and fads, the most telling insight can be ascribed to Peter Drucker who, in 1993 said ‘The most probable assumption is that no currently working ‘business theory’ will be valid ten years hence — at least not without major modifications’. So where does this leave us as working managers trying to make good decisions in a rapidly changing world? I would suggest decisions based on common sense and pragmatism, founded on experience, are likely to be far more effective than leaping onto the latest management fad both at the project level and higher management levels. Not worrying too much about the latest fad also helps reduce the learning load. And whilst not included in the diagram, there are plenty of project management fads and ‘silver bullet’ techniques being touted on a regular basis. But we all need access to useful, relevant and current information to develop our knowledge and ground our experience – competency is founded on knowledge!! One of our overriding considerations in developing these blogs, our published papers and our White Papers is to take new concepts and make the ideas both practical and usable. The other which is still a work-in-progress is to develop an indexed structure that makes the information easily accessible and findable (see: http://www.mosaicprojects.com.au/PM-Knowledge_Index.html). PMI’s 2013 ‘Pulse of the Profession’ Survey makes interesting reading, particularly given most of the world is in or near recession. PMI predicts that between 2010 and 2020, 15.7 million new project management roles will be created globally across seven project-intensive industries. China and India will lead the growth in project management, generating approximately 8.1 million and 4 million project management roles through 2020, respectively. Along with job growth, there will be a significant increase in the economic footprint of the project management profession which is expected to grow by USD$6.61 trillion. This enormous anticipated growth, along with higher-than average salaries, will make the next seven years an opportune time for professionals and job-seekers to build project management skills. The squeeze on talent has already started! PMI’s Pulse of the Profession shows that high-performing organizations don’t just emphasise strategy and improve efficiency. They cultivate talent resources to deliver successful projects and programs. With that talent, they can reduce risk, increase stability, improve growth and build a strong competitive advantage. In contrast, poorly performing organisations that don’t see talent as part of the success equation – they believe the job market is a bottomless pit of skilled people that can be bought in as needed. This puts their projects and their organizations at risk! Whilst more and more successful organisations have adopted talent management as a core competency, many others fail to invest in skilled project management talent and talent development initiatives, and this shows in their performance. The contrast is stark – high performing organisations are likely to find some $20 million at risk for every 1$billion invested in projects, whereas low performing organisations place $280 million at risk, over 10 time the amount. The low-performing organizations – those which complete 60% or fewer projects on time, on budget and within scope – are significantly less likely to provide a defined career path for project managers, a process to develop project management competency, and / or training on project management tools and techniques. Poaching talent is a zero sum game that simply drives up costs for everyone. As a result of this lack of investment, a talent gap exists in project management. A large number of skilled practitioners are reaching retirement age, organisations that train staff hold onto staff and the rest are going to find recruitment becoming increasingly difficult. Talent simply does not grow on trees – skills need developing and nurturing within the organisations that need them. The reason this matters is that at a time when project success rates are declining and risks are increasing, organisational leadership needs to fill an anticipated 15.7 million new project management roles worldwide by 2020. If they don’t, $344.08 billion in GDP will be at risk – and that’s not even counting the $135 million that organizations already risk for every $1 billion spent on projects. The ‘high performers’ achieve their results through a combination of good governance and good management. They see project, program and portfolio management as strategic capabilities needed to invest in their organisation’s future. They recognise process improvement and talent management are the two key elements that need investment to deliver outcomes. And they use well proven governance and management processes such as requiring active sponsors (79% of project have active sponsors in high performing organisations -v- 43% in low performing organisations). The inaugural PMI Australia 2013 conference is over. To create the event, the PMI Australian Chapters collaborated to develop a platform for professionals, academics and community representatives to share knowledge and experience. For a first time and a new committee it was a great start and we look forward to the 2014 event. Our contribution was a presentation: Communication ≠ Engagement that included the world’s first ‘mass verbal tweet’! Certainly social media and web technologies have made broadcast communication in the 21st century easier then ever, but communication does not equal engagement and the ‘verbal tweet’ proved this! Project success requires the key stakeholders, including senior executives and the sponsor to be actively engaged in support of the project objectives. And achieving engagement requires mutuality, a robust relationship built on empathy and trust, plus credibility and leadership to bring different stakeholder viewpoints into alignment to assist the work of the project. Effective communication is the tool that facilitates the building of relationships and engagement but this type of communication is focused, personal and two-way. As a consequence, the project team need to invest significant time and effort in these key communication channels. The challenge is identifying the right stakeholders and the right messages to communicate ‘at this point in time’. When our paper was originally submitted last year, I was expecting to be doing the presentation. However, in the interim I was accepted as a member of the International Faculty of the EAN University in Bogota, Colombia, presenting a Masters’ level course – Managing Project Teams. So I’m enjoying a few weeks in South America and the second author, Patrick Weaver enjoyed the hospitality of Sydney and presented the paper for us.